My recipe is adapted from this website. These are a bit persnickety to make, but were a BIG hit. Melt the candy melts, along with a tablespoon of shortening (to help thin the melted candy), in 30 second intervals on half power in your microwave until melted. Don't overheat the chocolate. Immediately start dipping, using a fork. Place on wax paper, and let them set up for at least ten minutes. 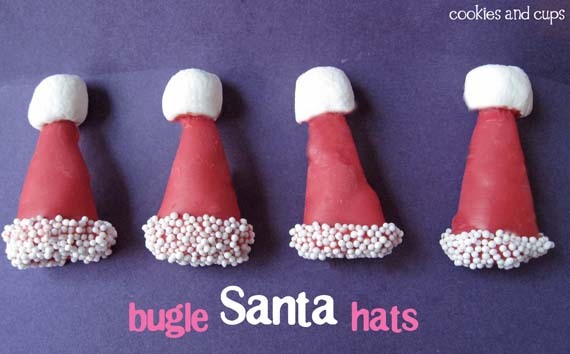 When they are set, remelt the red candy disk (if necessary) and dip just the bottoms (the large part of the Bugle) into the white sprinkles. Let those set. Then flip it over and dip the top in the melted candy and press a mini marshmallow on top. Melt the white chocolate like you did for the melting discs, with some shortening. Dip some of the pretzels in white chocolate in the same fashion as the hats, and let set, which takes much longer than the red melting discs. Mix plain pretzels and check mix. 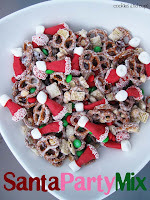 Add white chocolate covered pretzels and mix gently. Add M&Ms and peanuts, leaving some out to sprinkle on top. Gently mix. Very gingerly distribute Santa Hats, again leaving some out to sprinkle on top. Sprinkle remaining M&Ms and peanuts, serve.